Our firm represents businesses and individuals in legal matters arising in northern Illinois . 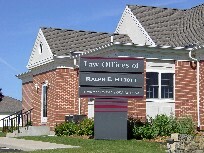 We include attorneys authorized to practice law in the trial and appellate courts of the state of Illinois, the Bankruptcy and U.S. District Courts for the Northern District of Illinois, including the trial bar, the Central District of Illinois, and the U.S. Court of Appeals for the Seventh Circuit. Our attorneys have over twenty-nine years of experience and strong academic backgrounds. We provide an assertive, detail-oriented approach to the practice of law. The foundation of our practice is to engage in strong communication with our clients, apply a common-sense approach to solving legal problems, and be flexible and responsive to our clients' needs. We use the latest in legal resources and technology and have a strong commitment to continuing legal education. Our goal is to provide cutting-edge legal services to our clients at hourly rates which are less than some similarly situated professionals in larger venues.